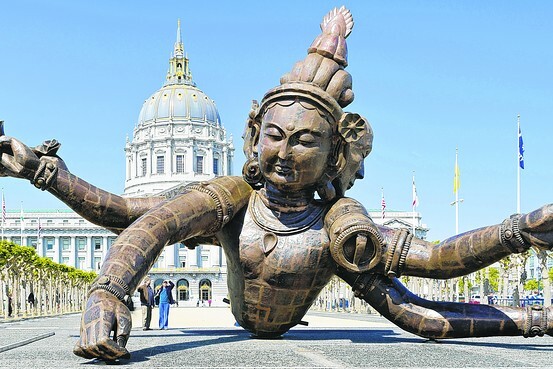 Zhang Huan’s ‘Three Heads, Six Arms’ — seen here in San Francisco — will be on show in Tsim Sha Tsui until June 30. The Hong Kong International Art Fair — Art HK for short — opens Thursday, but it’s just one of a weeklong series of events that include outdoor happenings and sales by more than a dozen auction houses. Hong Kong’s international art fair — Art HK — opens Thursday, but it’s just one of a weeklong series of events that include outdoor happenings and sales by more than a dozen auction houses. Of course, Art HK is the main draw, writes Alexandra A. Seno in an article for Weekend Journal Asia. Big dealers are flying in from New York or London, showcasing what some mischievously call “The Greatest Hits” — high-priced works by art-world stars. Some of the Art HK treats will include pieces by artists currently beloved on the international circuit but rarely seen in Asia, among them South Africa’s William Kentridge, Olafur Eliasson from Denmark and the late French-American sculptor Louise Bourgeois. But the fair will also feature plenty of art that speaks local: Of the 250 galleries at Art HK this year, 22 will be from Hong Kong, the most in the fair’s history. Here are excerpts from the Weekend Journal story, highlighting the top 10 picks for Hong Kong and Chinese art exhibits and happenings around the city during art week. See the slideshow, too. In the 1960s, having spent decades painting European-style landscapes of rural Hong Kong, Luis Chan decided it was time for change. “He felt he was ‘out of date’ and that he needed to renovate himself,” art dealer Johnson Chang recalls the painter saying. Mr. Chan, then in his 60s, began producing oil and ink works of a kind Hong Kong’s art establishment had never seen: dream-like works showing boldly colored human and animal figures in a fantasy universe. At Art HK, Mr. Chang’s Hanart TZ Gallery will exhibit about 20 works by the late Mr. Chan, who died in 1995. Drawing on the holdings of collectors and members of the artist’s family, it will be one of the biggest public exhibitions of Mr. Chan’s work in recent years. The earliest piece is from the 1940s—his Western painting period—and the latest is from the mid-1980s, when he was in full flower making uniquely trippy pictures. Until June 30 you’ll be able to see Zhang Huan’s “Three Heads Six Arms”—which weighs 15 tons and measures about 10 meters tall and 18 meters wide—in the outdoor plaza of the 1881 Heritage mall complex in Tsim Sha Tsui. The giant bronze sculpture was inspired by pieces of several Tibetan Buddhist statues bought at Chinese antiques markets. Before it was first shown in San Francisco last year, Mr. Zhang said: “‘Three Heads Six Arms’ reflects the changing realities of Chinese people today and also reflects the attitude that humankind has conquered nature and even reflects deeds of volition and hope.” One of the heads is a likeness of the artist, who is known for performance-art works that have involved, for example, smearing his body with fish oil and honey to attract flies, or gathering a group of artists on a mountaintop to lie atop one another naked (“To Add One Meter to an Unknown Mountain,” 1995). The sculpture is part of Mr. Zhang’s first solo gallery show in Hong Kong, at Edouard Malingue Gallery, in cooperation with The Pace Gallery, his U.S. representative. Artist Halley Cheng creates pen drawings, rendered on wood panels and inspired by traditional Chinese painting. His work mimics the style of the Song Dynasty, which lasted for three centuries at the start of the last millennium and is considered an apex of Chinese civilization. “Game Theory,” Mr. Cheng’s second show at Grotto Fine Arts, consists of eight works that mix famous old paintings with characters and stories from video and board games. There are other artists employing similar gimmicks. But Mr. Cheng brings a particular Hong Kong-centric sense his work. The show, which opened on May 7, will close May 28. The police regarded him as a nuisance, but in time artists and designers embraced him for his crude aesthetic, as a local eccentric and as an unlikely but popular anticolonial symbol. He became known in the media as the “King of Kowloon,” and his work even represented Hong Kong at the 2003 Venice Biennale. The exhibit “Memories of King Kowloon,” at Artistree, an art space in Quarry Bay, runs until the end of May. Highlights include a metal electricity box covered with Mr. Tsang’s handwriting and his scribbles on sheets of paper recounting his opinions and version of family history. Mr. Wong was one of the first to respond. He started a campaign to wear a button featuring a picture of the Chinese artist/activist with the word “Missing” below. For art week, Mr. Wong, supported by the nonprofit art foundation H-KAGE, will curate the nonselling show “Love the Future” at the Art East Island space in Chai Wan. The title refers to “ai wei lai,” a code name by which mainland bloggers referred to Mr. Ai, in order to dodge online censors. Alongside the art of more than 30 other artists, Mr. Wong will present his own larger-than-life “mud grass horse” that was the star of a Hong Kong protest march that drew 2,000 people last month. The creature’s made-up name in Mandarin sounds like an obscenity, and it is used in China on the Web as a symbol of opposition to Beijing. If you don’t recognize the name, you may remember this about Zeng Fanzhi: In May 2008, one of his paintings, “Mask Series 1996 No. 6″ sold for 75 million Hong Kong dollars (about US$9.6 million) at a Christie’s auction. It was, until recently, the highest price ever paid for a work of Chinese contemporary art. During the four days of Christie’s Hong Kong spring sales this month, “Being,” a retrospective of the artist’s work will be on display at the Hong Kong Convention Centre. The 30-work exhibition, which provides a survey of Mr. Zeng’s career, ranks as one of the artist’s biggest solo shows abroad (one in Singapore in 2007 beats it by just a few pieces). Newer works include paintings, inspired by ancient Chinese art, that depict landscapes and nature but in a contemporary style with expressionist brushstrokes. The show is mounted by Shanghai’s private Rockbund Museum, Christie’s and the personal foundation of François Pinault, the owner of the auction house. “For Your Pleasure—Remake/Remodel” is part of the first-year anniversary of the interesting little 2P Gallery in Hong Kong’s Western District. “It’s a show about the politics of aesthetics. It’s about challenging the image,” says Hiram To, who represented Hong Kong at the 2007 Venice Biennale. Mr. To has known Australian artist Scott Redford for more than 20 years, and the two have collaborated to mount this ambitious conceptual show, with works that reference Roxy Music, clothing designer Yohji Yamamoto and electric guitars. The 2P exhibit, the first of several projects this year by a usually reclusive top Hong Kong artist, underscores the new momentum in the territory for the kind of “smart art” that a sophisticated cultural city should have. From May 27 to mid-August, the virtual world of Beijing artist Cao Fei meets the works of Hong Kong’s art-and-architecture firm Map Office at the Savannah College of Art and Design’s Hong Kong gallery. The gallery will house “NO Lab,” a multimedia exhibition based on the rebuilding of flood-ravaged New Orleans. 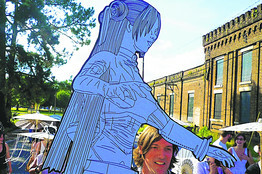 Since 2008, the exhibition has toured SCAD campuses in the U.S. and France. Now it is headed to Hong Kong, where the sculpture, drawings and photographs of “NO Lab” will be complemented by an interactive virtual-reality exhibit featuring Ms. Cao’s “China Tracey” avatar from the RMB City series, which was featured in its own pavilion at the 2007 Venice Biennial. “NO Lab in RMB City” was designed by Map Office, the partnership of the Hong Kong-based, French-born artists Laurent Gutierrez and Valerie Portefaix. In 1979, Huang Rui was a member of the Stars, the ragtag group of young Chinese artists that held Beijing’s first contemporary-art exhibit—on the sidewalk in Beihai Park. (Another member was Ai Weiwei, currently being held by Chinese authorities.) Their makeshift show was shut down by the police after just one day. Since then, Mr. Huang has enjoyed a stellar international career not only as a painter, sculptor and performer, but as a curator, intellectual and all-around leading figure in the mainland’s art community. Over decades, Hong Kong ink-painter Fung Ming-chip has worked on developing his own Chinese calligraphy styles. His works are in the Taiwan Museum of Art, Oxford University’s Ashmolean Museum and Hong Kong Museum of Art. Born in 1951 Guangdong, he grew up in Hong Kong and moved to in New York in the late 1970s. In the mid-1980s, he began to split his time between Asia and the U.S., returning to Hong Kong permanently in 2006. The Art HK booth of Sin Sin Fine Arts features 13 of his works that sample his styles: words that seem to disappear into the blackness of ink, characters that cling to the margins of the paper, graphically striking works where the words matter less than the balance of negative and positive space in the composition. Get the Scene Asia app at the App Store.